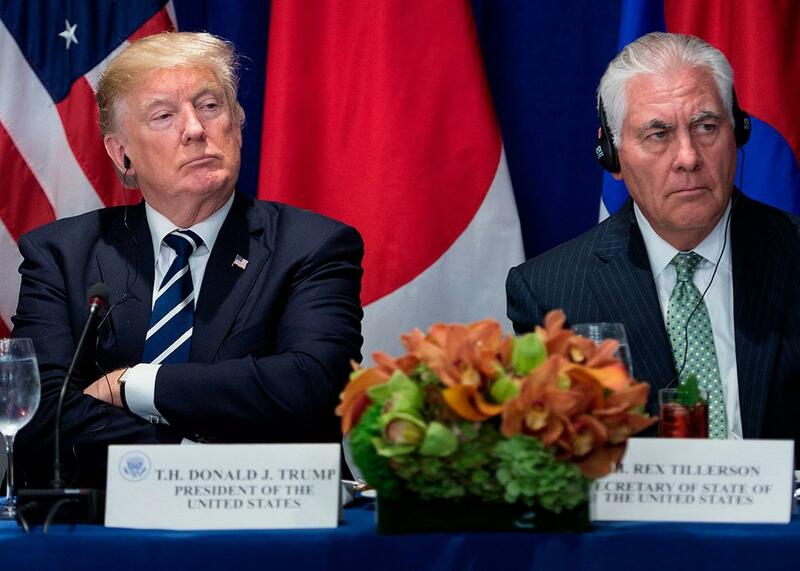 Trump undermines Tillerson on North Korea. Who actually speaks for U.S. foreign policy these days? Trump’s public smackdown of Tillerson makes it clear that the administration’s foreign policy dysfunction is getting dangerous. Some analysts think Trump and Tillerson might have been playing “good cop, bad cop.” This is extremely implausible. More likely, we were witnessing the stumbling interaction between a secretary of state who doesn’t get diplomacy and a president who doesn’t want it. This is good news in that it reflects a realization that diplomacy may be the only way out of this crisis. But Tillerson doesn’t seem to realize that the whole point of these sorts of talks—“back channels,” they’re often called—is to explore intentions and possibilities out of the limelight away from political pressure. A few days earlier, Trump’s national security adviser, Lt. Gen. H.R. McMaster, had denied that the administration was holding direct talks with North Korea, adding, “When we do, hopefully, it will not make it into the New York Times.” And now here was Tillerson telling the New York Times. Back-channel talks may prove fruitless, but they’ll certainly go nowhere if they’re publicized. Then came Trump’s brutal undermining. If anyone in Pyongyang or Beijing had been taking Tillerson’s overtures seriously, they could do so no longer. North Korean officials had already been frantically phoning experts in the United States, asking how to interpret the contradictions between Trump’s words and those of his top national security advisers. Whose words, they are asking, should they view as authoritative? After the weekend’s tweets, their confusion—and ours—have no doubt further deepened. Strategic ambiguity sometimes has a place in global politics, but basic confusion—who’s in charge, what’s a red line and what isn’t, what can you put on the table and what is non-negotiable—serves no purpose and only aggravates tensions. In the real world, Burt and his Soviet counterparts managed to sign the Strategic Arms Reduction Treaty, in 1991, without throwing any temper tantrums. “OK, well, I’ll tell the Koreans they’ve got 30 days,” Lighthizer replied. The problem is, Nixon’s plan—and by the way, he called it the Madman Theory—didn’t work. The North Vietnamese kept fighting. There’s another problem with the whole business of bluster: If your opponent calls your bluff, what are you going to do? Nixon followed through on his, bombing the hell out of North Vietnam, unloading more tonnage than all the bombs dropped on Germany in all of World War II—and yet the North Vietnamese kept fighting. What will Trump do when the North Koreans call his bluff? Will he drop bombs on them and trigger what U.S. intelligence analysts see as an almost inevitable retaliatory blow against South Korea or U.S. military forces in the region? Or will he back down, in which case he’ll look weak—and more to the point, no one will ever take his threats (or promises) seriously again? This is the danger of bluffing with real weapons. In his 1960 book On Thermonuclear War, the strategist Herman Kahn likened this to the game of highway chicken in which two cars speed toward each other, head-on. There are three possible outcomes to the game. One driver gets nervous and veers away at the last second; he loses. Both drivers veer away; the game’s a draw. They both keep zooming straight ahead; everybody dies. Kahn wrote that one way to win at chicken was to detach the steering wheel and toss it out the window; the other driver, seeing that you can’t pull off the road, will be forced to veer off. North Korea has been playing a version of this game—acting erratic, threatening fire and fury against all comers—for 70 years. Kim Il-sung, the regime’s founder (and grandfather of the current leader, Kim Jong-un), viewed his country as a “shrimp among whales” and saw the tactic as a mode of survival. What’s new about the current confrontation is that the president of the United States seems to be indulging in the same tactic. Maybe Trump believes the novelty will arouse so much alarm that the North Koreans—or maybe the Chinese, whom he believes can pressure the North Koreans—will shape up and do what he wants them to do. But what if (to use Kahn’s analogy) both sides have thrown their steering wheels out the window? What if Kim can’t get rid of his nuclear weapons, which he views as his only means of protection? What if Trump can’t back down from his threats to destroy North Korea (“ … we’ll do what has to be done!”), lest he suffer a blow to his esteem (the worst sort of blow to Trump)? Tillerson had the right idea. There need to be direct talks, if just to “probe” what the North Koreans want, what they would take in exchange for at least freezing their nuclear program (we should forget about making them get rid of their nukes, they’re not going to do that), and how to enforce the deal on both sides. Too bad that Tillerson doesn’t know how to do this sort of thing. And worse still that we have a president who doesn’t want to back him up, whether because he’d rather solve the problem militarily or because he really believes that acting “crazy” will sire a better deal. Anyone who still believes that Trump can be constrained by the “grown-ups” in his Cabinet should read his Sunday tweets. Words—these sorts of words—can do enormous damage, which all the assurances whispered by Tillerson, Mattis, or McMaster can do little to abate. Trump is the decider, and those who try to convince themselves otherwise are kidding themselves.